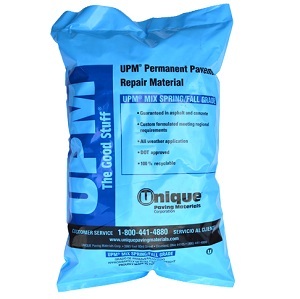 Search Results for : "upm cold mix"
UPM® cold mix asphalt (Winter Grade). The Winter Grade formulation is engineered to perform at installed temperatures below 40º F.
50lb bag - 56 Bags per Pallet. UPM® cold mix asphalt (Spring/Fall Grade). The Spring/Fall Grade formulation is engineered to perform at installed temperatures from 40º – 60º F.
UPM® cold mix asphalt (Summer Grade). The Summer Grade formulation is engineered to perform at installed temperatures from 60º – 80º F.
Very durable construction and materials for road repair solutions.